Transform your living room into a state-of-the-art cinematic auditorium with the all-new Shockwafe Ultra 9.2 SSE Dolby Atmos / DTS:X Soundbar (2019), featuring Nakamichi Spatial Surround Elevation (SSE) processing technology. Experience up to 9.2.4 channels of multi-dimensional surround sound with our signature dual 10” wireless subwoofers, 4 modular surround speakers and front side-firing effects tweeters that merge to deliver 360° moving audio around, above and beyond you. Discover what you have been missing and step into the future of home theater. The Best Soundbar in the market just got a monumental upgrade. *Dolby Atmos, Vision and SSE require firmware upgrade (available mid Jan 2019) for Ultra 9.2 DTS:X 2018 model. Envelop your home theater with up to 9.2.4 channels of Dolby Atmos or DTS:X object-based multi-dimensional audio that flows around, above and through you. Unleash cinematic concert level bass effects that are smooth and impossible to localize. Be prepared to hear and feel the sonic boom that rattles your soul. 6 adaptive placement options to deliver 360-degree surround sound to any acoustic environment. Unlock next level lifelike audio performance by enveloping everyone in surround effects from every direction. For those aspiring to create a true high performance theater experience, this all-in-one solution combines power, precision, and performance stretching every innovation boundary and redefining the expectations in soundbars. 3 advanced processing engines work in harmony to reproduce immersive audio in extraordinary detail. 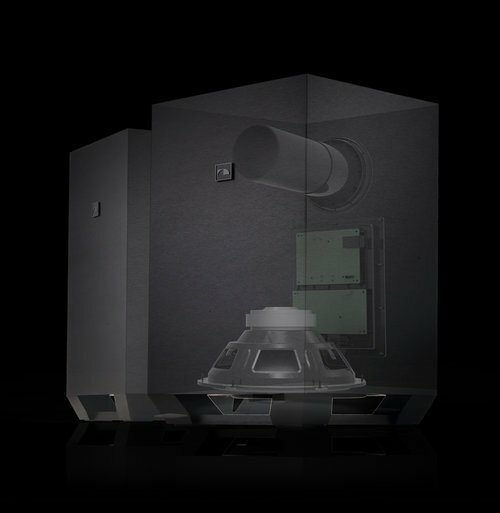 Performs spatial-amplification techniques and engages the 4-6 high-frequency tweeters located around the user (4 for 7.1/7.2 SSE and 6 for 9.2 SSE) to unlock extra details, enhance directionality and enlarge spaciousness of the surround sound experience. Executes upmixing, phase and volume improvements to optimize the clarity and balance of the surround sound across all channels, delivering up to 9.2.4, 7.2.4 and 7.1.4 channels of uncompromising surround sound on the Ultra 9.2, Elite 7.2 and Pro 7.1 SSE models, respectively. 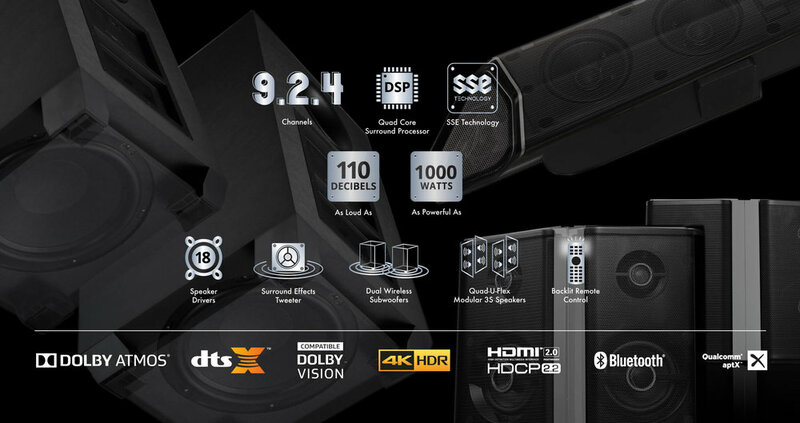 Enables the processing of all the latest 3D object-based content, including Dolby Atmos and DTS:X, and interlaces a height effects sound layer into each of the 12-16 speaker drivers (12 for 7.1/7.2 SSE and 16 for 9.2 SSE) located around the user, resulting in the most immersive perception of directionally vertical effects. Transform your living room into a cinematic auditorium. Dolby Atmos® transports you from the ordinary into the extraordinary with breathtaking, moving audio that fills your room and flows all around you, even overhead. DTS:X delivers individual sounds anywhere in your room and moves them around in a 3D space, including above you. With older formats, sounds only move front to rear and left to right, but not up and down like DTS:X. Our revolutionary Surround Effects Tweeters reflect sound off walls and ceiling, delivering a 35% wider soundstage filled with dynamic surround details for a more immersive home theater. Discover never-heard-of surround details with our 2-Way Surround Speakers. The tweeter reproduces high frequencies with captivating clarity, while the full-range driver delivers surround effects with power and precision. The embedded top end Cirrus Logic Quad-Core Digital Signal Processing chipset processes the most demanding surround soundtracks with unprecedented speed, detailed precision and lifelike clarity. The Duet: World's First Dual 10” Wireless Subwoofers. Our signature dual subwoofer configuration stands alone as the soundbar reference standard for bass. Featuring 10" drivers with massive motor magnets, our subwoofers effortlessly fill the room with extreme kinetic energy at any listening level. An entirely new dimension of bass performance, a dimension so satisfying that listening to a single subwoofer will forever become an act of compromise. 6 Placement Options available to match the acoustics of your room. *Quad modular surround speakers are wired to wireless subwoofers (2 each). 1 Side Surround and Rear Surround speakers are connected to both subwoofers by using bundled surround speaker cables. 2 Requires free firmware upgrade for Ultra 9.2 DTS:X. Available mid Jan 2019. Refer to www.nakamichi-usa.com/shockwafe-sse for more details. Manufactured under license from Dolby Laboratories. Dolby, Dolby Atmos, Dolby Audio and the double-D symbol are trademarks of Dolby Laboratories. DTS, the Symbol, DTS-HD, and DTS or DTS-HD and the Symbol together are registered trademarks of DTS Inc., and all other DTS logos are trademarks of DTS, Inc. For DTS patents, see http://patents.dts.com. Manufactured under license from DTS Licensing Limited. DTS, the Symbol, DTS in combination with the Symbol, DTS:X, and the DTS X logo are registered trademarks or trademarks of DTS, Inc. in the United States and/or other countries. © DTS, Inc. All Rights Reserved. Bluetooth is a registered trademark of Bluetooth SIG. Inc. The Bluetooth word mark and logos are registered trademarks owned by Bluetooth SIG, Inc. and any use of such marks by Nakamichi LLC is under license. Other trademarks and trade names are those of their respective owners. Shockwafe Ultra 9.2 is rated at 110dB. The Sound Pressure Level is measured using pink noise at 1 meter, C-weighted. The Total harmonic Distortion calculated as an electrical measurement of amplifier distortion. Wireless Subwoofers are rated -3dB @ 30Hz. Nakamichi uses the industry standard LINEAR X SYSTEMS, LMS electroacoustic analyzer. The bass frequency is measured using swept sine wave at 2 meters, parallel to the subwoofer driver’s technique.